The monitoring filter is applied at the beginning of a monitoring session. A filter string allows tail matching after delimiter. Thus Module == SurF.exe matches “C:\Program Files\SurF.exe”, but not “C:\Program Files\OverSurF.exe”. During matching class name contains its namespace: Class == FileSystemWatcher matches System.IO.FileSystemWatcher also due to the tail matching. A filter string allows prefix matching by using * at the end: Module == C:\*. It also allows filter by namespace: Class == System.IO.*. 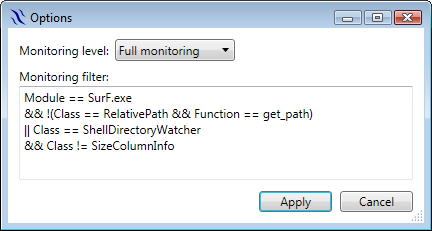 When monitoring a C++/CLR application, “native” functions are represented as the class <Module> and “native” class included in the function name. For example, to exclude classes and functions in the std namespace use Function != std.*. The buttons in the Runtime Flow toolbar allow filtering by function and the buttons in the Runtime Sumary toolbar allow filtering by function, class, namespace and module.